← Is TV the Future for Twitter? 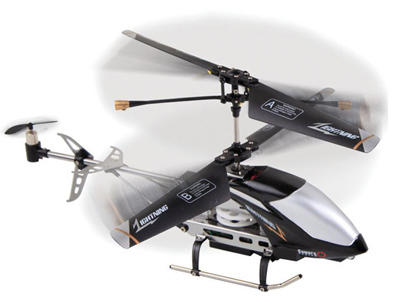 The Holiday Season is almost here and most of us have feverishly begun to browse the shops for potential different gifts and a cool gadget which we warmly recommend as a gift for your teenager is the Indoor Reconnaissance Helicopter. This is a remote control reconnaissance helicopter which comes with a built-in camera which allows you to record all that you desire. The camera is located beneath the helicopter and can be oriented at a 200 angle. You are able to film up to 30 minutes of video in AVI format at a 640×480 resolution. The video is stored on a 1GB microSD card and can be easily copied and transferred to a computer by the use of a microSD to USB cable which comes with the package. Both the helicopter and the camera can be controlled by an infrared remote control which even permits you to turn the camera on and off. The helicopter itself is quite easy to control and the horizontal tail rotor combined with the two contra-rotating coaxial main rotors work in such a manner as to keep the helicopter constantly in balance even through up and down, left and right, forward and backwards commands in flights. The Indoor Reconnaissance Helicopter works with the aid of 6 AA rechargeable batteries which are not included. A set of fully charged batteries will offer you a seven minute flight. The batteries require 40 minutes to be recharged. This wonderful gift is recommended for ages of 14 and above. If you intend to purchase it for a smaller child it is highly recommended that you supervise him/her while he is using the Indoor Reconnaissance Helicopter. So, if you desire to give a cool gadget as a Christmas gift or any other occasion to your close one, then you should take a look at the Indoor Reconnaissance Helicopter. This nifty little gadget will definitely bring you and your close ones wonderful memories and great pass time. So start spying and recording all you want around the house starting today with this cool gadget, the Indoor Reconnaissance Helicopter. We promise you that you will not regret what it has recorded.